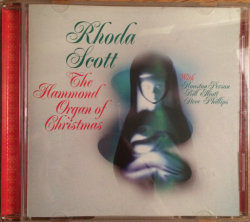 For this set of Christmas songs, organist Rhoda Scott, in a quartet with tenor saxophonist Houston Person, is heard on all but two songs playing duets with drummer Bill Elliott in 1977. The organ playing sounds like it is straight from a very reverent church service. The two songs with Person (and drummer Steve Phillips) from 1993 are supported by Scott's vocals.